Two members of the University of Calgary Firearms Association. Photo by Theresa Tayler. 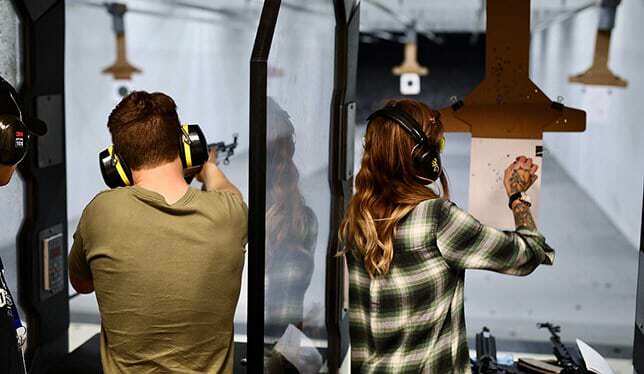 TheGunBlog.ca — If you run a gun club, range, store or training, please read the article published today in University Affairs by a new shooter describing her first trip to a campus gun club (at the Calgary Shooting Centre). It’s informative and encouraging. The feature, A Night at the Gun Club, offers valuable perspective for shooting-industry professionals who may have forgotten how intimidating it is for newbies. The report also provides some good practices to copy. It’s a glimpse inside the mind of a new shooter. The reporter, Theresa Tayler, shares her assumptions and walks us through how she perceives all the strange and scary sounds and sensations. Gun clubs, ranges, stores and trainers are on the front line of determining the future of shooting in Canada. If you’re in the business, you have the power to draw people in or push them away. The people cited in the article provided a welcoming experience. How can we use them as role models, what can we learn from them, how can we support them? The reporter went to Calgary Shooting Centre. I also had a good experience during my one and only visit there last year. Beautiful store, smiley and helpful staff, nice indoor range. Most shops and ranges aren’t like that. Informative content about the state of shooting on campus today. Encouraging to read accurate, fair and sincere reporting based on personal experience and research, rare qualities when Canadian media write about guns and shooting. Can campus clubs, local gun stores and instructors work together to encourage new shooters, perhaps offering student discounts or other perks? Guns, ammo and gear are expensive, especially for students. Can clubs/ranges that make a good impression invite more media? Thank you to @Canada Gun Club, a top source of firearm news on Twitter.